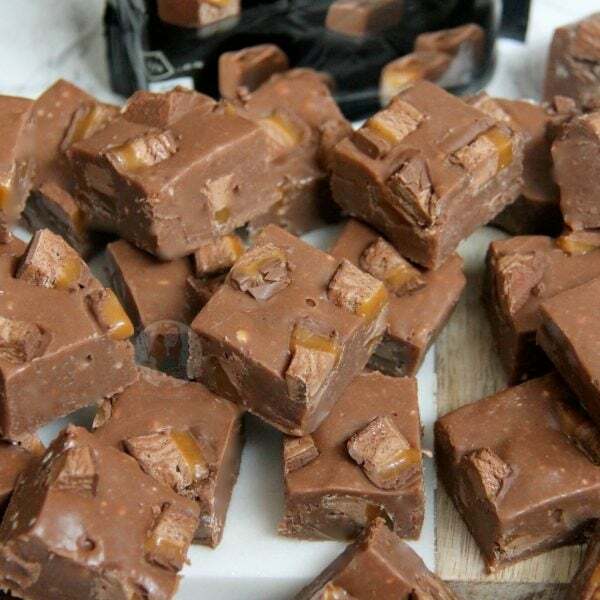 Delicious and Easy Mars Bar Fudge with chunks of Mars Bar throughout. 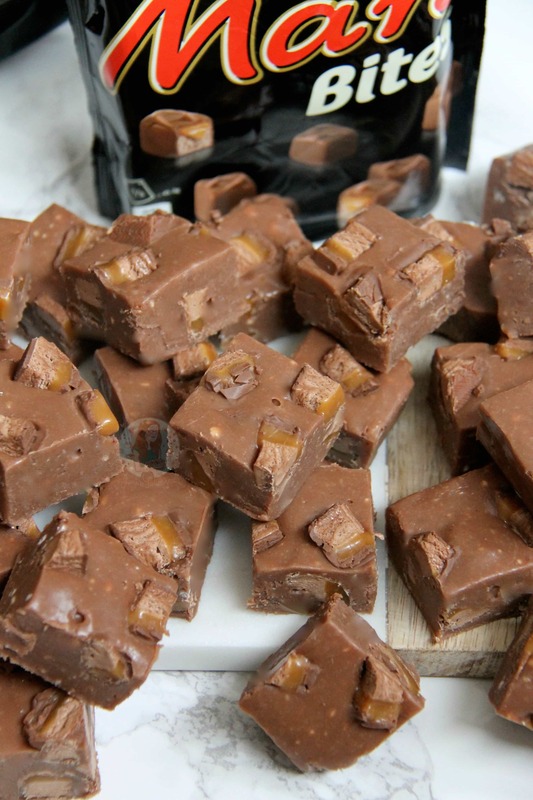 No Boiling or Sugar Thermometers, just quick and easy fudge for all Mars Bar Lovers! So yeah, this is calorie free right? Maybe not… but its worth that extra bit of exercise at the gym. Honestly, I LOVE THIS RECIPE. I know I say that about basically all of them, but having a Fudge that is so easy to make, that has melted Mars Bars in the actual Fudge makes it taste so freakin’ good I can’t cope. These little treats were snapped up REALLY quickly by my Trusty Taste Testers, with people having several pieces each. Yes, it will be sweet, but what do you honestly expect from Fudge? I love it either way. 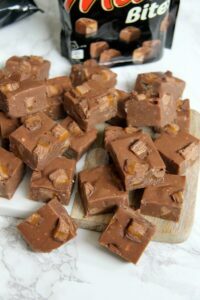 You could add a bit of salt to the mix if you didn’t want it to be quite as sweet, but if you want the true Mars Bar fudge experience then follow this recipe. You won’t regret it. This is another one of those easy ‘cheats fudge’ recipes based on the original Carnations Recipe. I obviously change all of my fudge recipes up to slightly differing quantities, and different flavours. 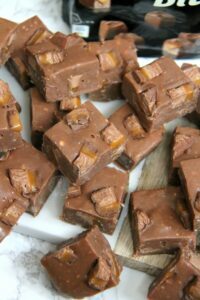 This time, melting Mars Bar into the actual Fudge was SO GOOD. You have to melt the Mars Bar carefully because of the nougat/fudgey part, and the caramel bit. Melting it along with the other chocolate, the condensed milk, butter and vanilla on a low heat is perfect. I even use a portable gas cooker now as my Ceramic hob is USELESS at melting things like this successfully! Empty the tin of condensed milk into a heavy based saucepan, and add the 275g chopped Mars Bar, Milk Chocolate, Butter, and Vanilla and melt on a low heat, stiring often so that the chocolate doesn’t catch on the bottom and burn and so that all the ingredients mix together well. Once melted, take off the heat. Tip in the sifted icing sugar and combine well with a spatula, it might take a bit of beating, but its worth it! Leave the mixture to cool for 5 minutes. Beat again, and add half of the chunks of Mars Bar and fold quickly. Pour into the tin and smooth over the mixture. 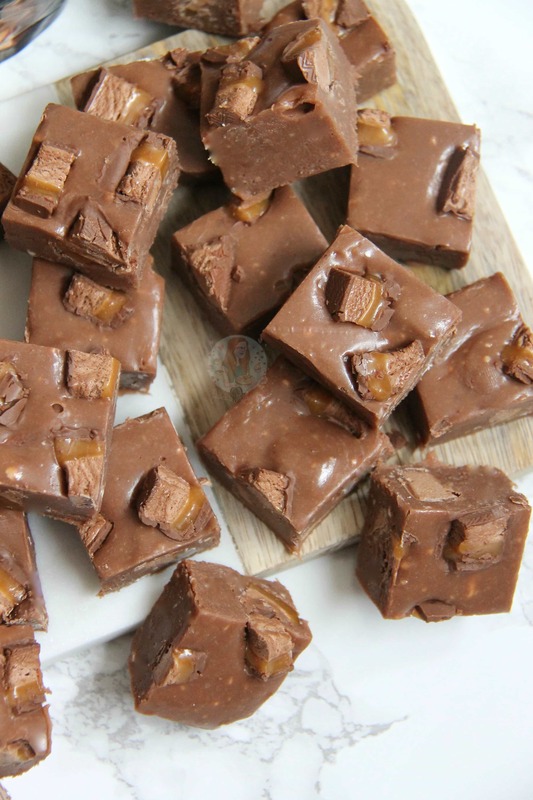 Sprinkle on the rest of the Mars Bar bits and press into the top of the fudge and store in the fridge for at least 5-6 hours (Or preferably overnight) to set! Mars Bars are Milky Ways in America I believe? 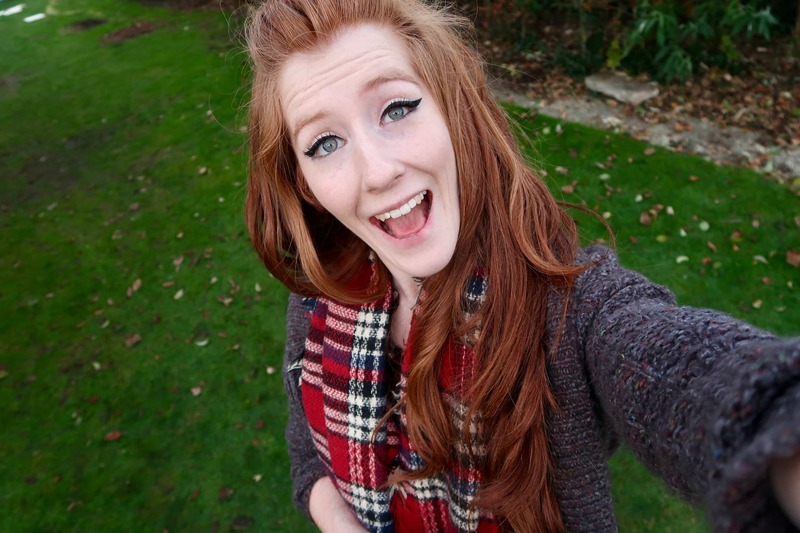 But its worth checking out an alternative if you’re from a different country to the UK! You can use Dark Chocolate instead of the Milk Chocolate if you like to make it slightly less sweet! 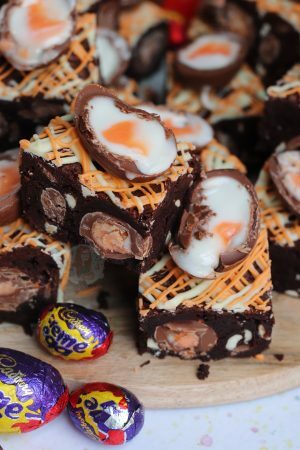 I used a 10x 33g Packet for this, and I used up 275g worth in the actual fudge mix. It was about 8 or 9 of the bars made the 275g of Mars for the fudge, and then used the other 1/2 bars, plus a bag of Mars Bites to chop up and sprinkle on top and fold a few bits through. 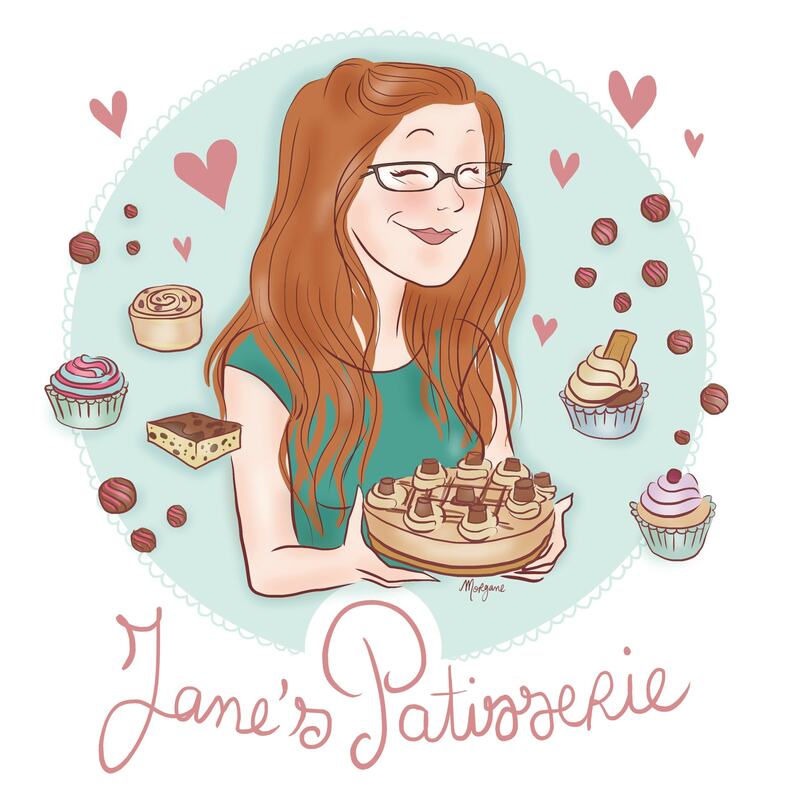 Older Next post: Creme Egg Chocolate Mousse! Newer Previous post: No-Bake Double Decker Cheesecake! 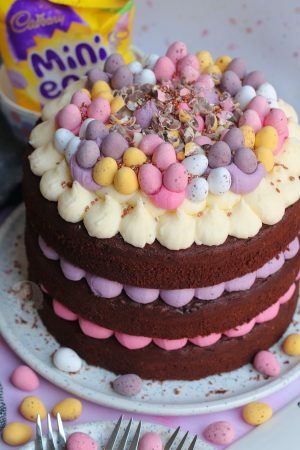 I’ve made this today, I seived the icing sugar and mixed it in but now it’s got loads of clumps on icing sugar in, have I done something wrong? 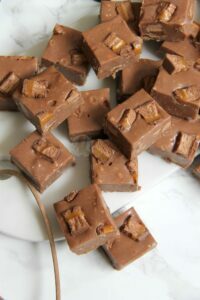 I’ve made the biscoff fudge 3 or 4 times now and always perfect, I tried this one for a change but it just won’t set! It was more liquidy than the biscoff one when I was putting it in the tin and it’s just refusing to properly set! 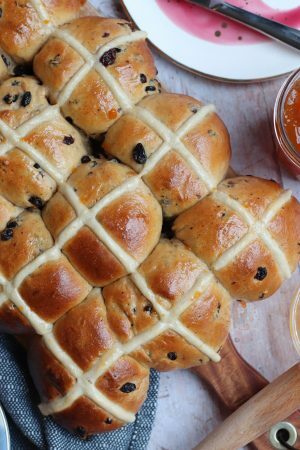 It’s sticky and soft – is there anyway I can salvage it or do I need to start all over again?